As it enters into the business end, Champions League is getting more and more interesting. With just 5 matches to go, we still don’t know the final 4 teams for the semis. Only South Australian Redbacks have booked their semifinals birth. Guyana, Central Stags and Mumbai Indians are out of the semifinal race, while Wayamba are on the verge of getting knocked out. So it's a battle between 6 teams (Warriors, Highveld Lions, Victorian Bushrangers, Royal Challengers Bangalore, Chennai Superkings and Wayamba Elevens) for the 3 semifinal spot. Let's, look at what the equations say. We will talk about Group ‘A’ first. Warriors are almost there. If Wayamba beat Bushrangers today, then Warriors will go through even before their last match. But, if Bushrangers win then Warriors will have to beat Chennai Superkings to go through. And If Chennai Superkings beat Warriors, then it will come down to the net run-rate, because there will be three teams then (Warriors, Victorian Bushrangers and Chennai Superkings), with 3 wins each. Wayamba Elevens have an outside chance. 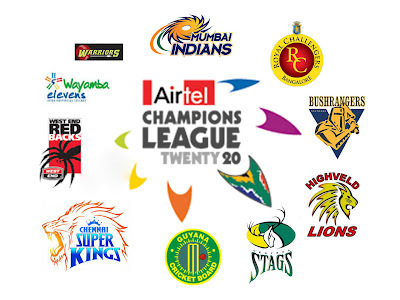 They have to beat Bushrangers and Central Stags by a huge margin (which is highly unlikely) and hope Warriors beat Chennai Superkings in the last match, then again there will be three teams (Wayamba, Victorian Bushrangers and Chennai Superkings), with 2 wins each and the teams with a better net run rate will qualify. Victorian Bushrangers have to beat Wayamba Elevens in their last match today and hope Warriors beat Chennai Superkings. In this situation, Victorian Bushrangers and Warriors will go through to the semis. If Chennai Superkings beat Warriors, then it will again come down to the net run-rate between these three teams. In this situation, Victorian Bushrangers will be out because Chennai Superkings' net run-rate is way better. Chennai Superkings have to beat Warriors to go through to the semis, even if Victorian Bushrangers win their last match against Wayamba. If Wayamba beat Bushrangers, then Chennai Superkings will be almost there, even if they lose their last match to Warriors because they have a higher net run-rate than Victorian Bushrangers. Now we will look at the equations of the Group ‘B’. South Australian Redbacks have already qualified from this group. Last match of the Group ‘B’ between Royal Challengers Bangalore and Highveld Lions will decide the second semifinalist from this group. It will be virtual Quarter-Final. Royal Challengers Bangalore have to beat Highveld Lions to go through. In this situation, both teams will be with 2 wins each and Royal Challengers Bangalore will qualify because of their better net run-rate (Mumbai Indians have won 2 matches too but they have the worst net run-rate). Highveld Lions have to beat Royal Challengers Bangalore to book their semis birth. They have already won their 2 matches. In short, whoever wins in this match will go through.